Today's combination is our Raspberry Cilantro Chicken Power Bowl. But you can honestly make these a million different ways. Here's our basic combination: whole grains (we typically use quinoa), dark leafy greens (kale or spinach), protein (chicken, shrimp, tuna, lean steak or even tofu all work well), beans, fruit, nuts & extra veggies topped with a homemade raw dressing. 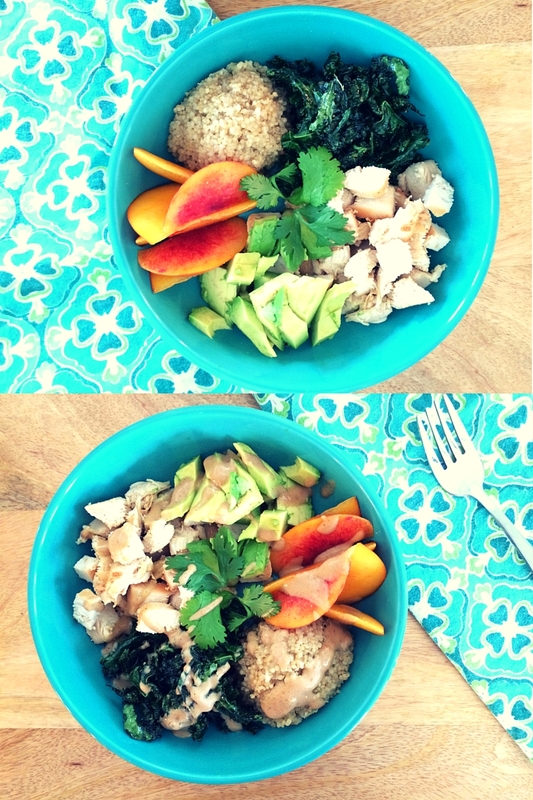 Our Raspberry Cilantro Chicken Power Bowl is a combination of diced chicken breast, fresh peaches, sauteed kale, protein packed quinoa and creamy avocado. We topped this with a fruity dressing of simply fresh raspberries & cilantro blended with cilantro. Drizzle over the top for a sweet finish! Power bowls typically come together super quick for us as we always have cooked quinoa in the fridge and make this with any leftover protein we have on hand. What's your favorite power bowl combination? 1. Place chicken in sauce pan and cover with water. Bring to a boil and cook for 20 minutes until chicken is cooked through. Cool chicken and dice into cubes. 2. Add 2 tbsp of EVOO to saute pan and heat to medium heat. Add fresh kale and season with garlic powder. Saute 5-6 minutes until wilted. 3. Cook quinoa according to package directions. Season with salt & pepper. 4. Add raspberries, cilantro, 2 tbsp EVOO & juice of one orange to a blender and blend to combine. 5. 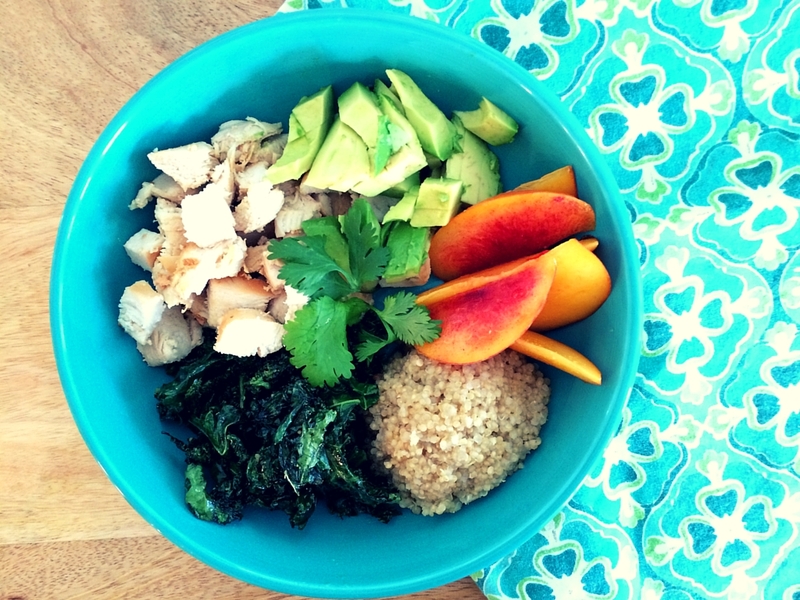 Plate up a scoop of quinoa, chicken, kale, peaches & avocado. Drizzle with raspberry cilantro dressing. I would love to try this with some black beans!!! That dressing sounds so delicious, do you think it would still work without the oil?